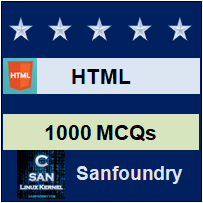 This set of HTML Multiple Choice Questions & Answers (MCQs) focuses on “Meta Data”. 1. Metadata store information about the web page that is not necessarily visible to end users. Explanation: Metadata is “data [information] that provides information about other data. Meta tags store information about the web page—known as metadata that is not necessarily visible to end users (unless you reveal the page source code). 2. In which part of the HTML metadata is contained? Explanation: Metadata is information about data. The meta tag provides metadata/meta information about the HTML document. Metadata will not be displayed on the page. Metadata is present in head. The body tag defines document’s body. A title tag is an HTML element which specifies the title of a web page. 3. Which of the following is not a function of robots meta tag? Explanation: Valid values for the “CONTENT” attribute are: “INDEX”, “NOINDEX”, “FOLLOW”, “NOFOLLOW”, “NOARCHIVE”. “NOREPEAT” is not any of robots meta tag. Explanation: A charset attribute is new in HTML5. The charset is used to provide the character support. The charset attribute specifies the character encoding which is in an external script file. 5. __________ prevents the page from being indexed altogether. Explanation: NOFOLLOW attribute instruct search engines that a hyperlink should not influence the link target’s ranking in search engine. NOINDEX prevents page from being indexed. To prevent a page from being cracked, NOARCHIEVE tag can be used. The noindex value of an HTML robots meta tag requests that automated Internet bots avoid indexing a web page. 6. Which of the following is not supported in HTML5? Explanation: The scheme attribute is supported in HTML but not in HTML5. Rest of attributes like “content”, “http-equiv” and “name” are supported in both HTML as well as HTML5. The scheme element is deprecated from HTML5. 7. ___________ prevents search engines from following links inside the page. Explanation: NOFOLLOW attribute instruct search engines that a hyperlink should not influence the link target’s ranking in search engine. NOINDEX prevents page from being indexed. To prevent a page from being cracked, NOARCHIEVE tag can be used. 8. Different meta tags are defined by changing the __________ attribute to a valid value. Explanation: The information/value of the content is provided by http-equiv through http header. Some values associated with http-equiv and name attribute are given by the content attribute. A scheme that to be used to interpret the value of the content is specified by the scheme tag. The name attribute specifies the name of input element and thus provides information/value of it. 9. __________ prevents search engines from showing a cached link for the page. Explanation: The “noarchive” meta tag is used to tell browsers not to store cached link for the page. A “nofollow” attribute instruct search engines that a hyperlink should not influence the link target’s ranking in search engine. The “noindex” prevents page from being indexed. 10. The value of the ___________ attribute refers to the time interval in seconds before the refresh is performed.